Make this risotto for a simple supper dish that is full of flavour. It uses Galbani Dolcelatte® Cremoso which is a blend of traditional Italian blue cheese, ricotta and mascarpone. Dolcelatte ®Cremoso can be used for dips, pasta sauces and salad dressings. Heat the butter in a large pan and cook the pancetta, onion and garlic for 5 minutes until the onions are softened and the pancetta golden. Add the rice and stir to coat in the butter. Pour in the wine and bubble vigorously for 2-3 minutes until the liquid evaporates. Stir about a quarter of the hot chicken stock into the rice. The chicken stock should be hot when it is added at each stage, so keep it heated in a separate pan. Keep stirring until it has been absorbed. Add a further quarter of hot stock and continue in this way until it has all been added and absorbed, and the grains of rice are tender - this takes about 20 minutes. 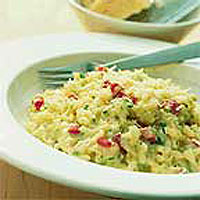 Remove the risotto from the heat and stir through the Dolcelatte™ Cremoso and parsley. Season to taste. Divide between serving bowls, sprinkle with freshly grated Parmigiano-Reggiano and serve immediately.